Eventful visit of the delegation from Lithuania to the Kherson region. On Friday, September 1, the Lithuanian delegation led by the Chairman of the Seimas of the Republic of Lithuania Viktoras Pranckietis made a fruitful one-day visit to the Kherson region together with members of the Mejlis of the Crimean Tatar people and its Chairman Refat Chubarov, with the participation of representatives of the Kherson authorities. 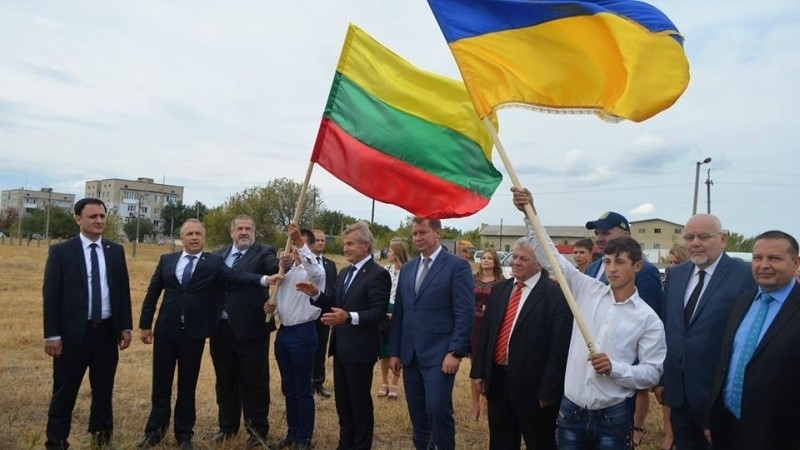 First of all, the members of the delegation reached the administrative border with the temporarily occupied Crimea at Chongar, where Refat Chubarov told the Lithuanian guests about the annexation of the Crimean peninsula. This was the first visit of the Lithuanian politician Pranckietis to the "zero point". Earlier Mr. Pranckietis said that with such a step he intended to demonstrate that Lithuania would never recognize the Russian occupation of the Crimea. Then the Lithuanian guests paid a visit to the base of the battalion named after Noman Çelebicihan, where Lenur Islyamov, Vice-President of the World Congress of the Crimean Tatars, told them about the activities of the formation. In Novoaleksiivka, Viktoras Pranckietis took part in the celebrations on the occasion of the beginning of the new academic year and, in particular, visited the opening ceremony of a new Crimean Tatar class. After the performance of the national anthems of Ukraine and the Crimean Tatars, as well as songs and dances, the Chairman of the Lithuanian parliament wished the students good luck and presented them with small gifts like books, exercise books, sweets and school bags. All those present were amazed that the Lithuanian politician congratulated the guests to Eid al-Adha in the Crimean Tatar language, provoking a round of applause. Mr. Pranckietis also joined the celebration of Eid al-Adha in the House of Culture of Novoaleksiivka, where guests were treated to the dishes of the national Crimean Tatar cuisine.